At this point, we have probably all reached “peak dress”, been oversaturated by all matters dress and are ready to move on. But there is more. 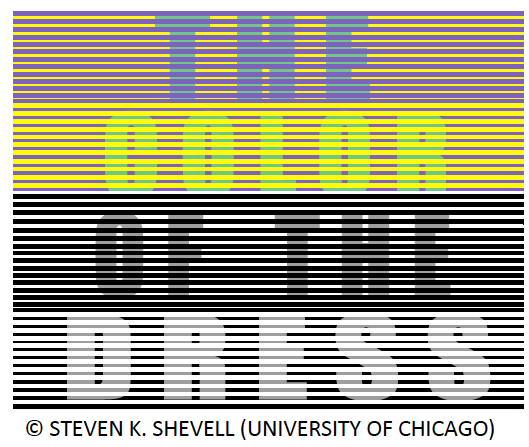 There is no question that “the dress” is the most viral image relevant to science in the history of the internet (well more than 9 million tweets in 2 days). Some people noted that this is quite a self-indulgent debate in light of all the serious problems facing the world today. Don’t we all have more important things to worry about? This is a particularly likely sentiment if someone doesn’t immediately “get” what the big deal is about (people are more likely to “get” it, if the interpretation flipped on them as they were looking at the dress, or if someone close to them vigorously insisted that they sincerely see it different). 1. 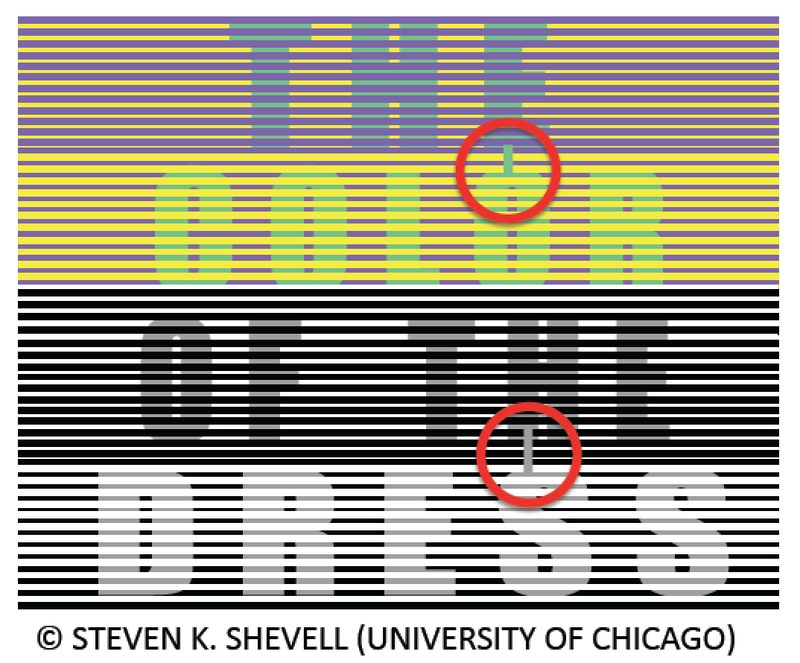 It’s not about the dress – it’s about visual perception and human cognition. 2. Perception is inherently a guess and even the best guesses can be wrong. It should not be surprising that different people guess differently – or even the same person differently at different times – if the information one starts with is ambiguous. Two different colors, top vs. bottom, right? 3. Basically, the brain is playing a game of telephone. Only the eyes have direct access to the physical light energy in the environment. The human visual system consists of at least 30 distinct areas that get information from earlier ones. All later areas have to rely on what the earlier areas (and ultimately the eyes) tell them is going on. This transmission is fundamentally unreliable. Information is lost at every step. 4. All of this has been documented many times – and known for over 150 years – in many domains of vision, but *not* color vision. To my knowledge, this is the first strongly “bistable” stimulus – where interpretations can be radically different – in the color domain. 5. It has been known for a long time that color vision is strongly susceptible to illumination and context. This is not a bug, but a feature that allows to identify objects despite varying illumination conditions. This suggests that the reason people differ in their interpretation is because they differ in their assumption what the light source might be. The little links between the two regions might convince you that they are actually the same, but look different. Context does matter. 6. What is particularly intriguing is that the interpretation readily shifts for most bistable stimuli like Rubin’s vase, rotating spheres, etc. – but not for the dress. Some people never shift, others do but on a time scale of hours and once they flip, they can’t flip back. This suggests that there is some kind of rapid perceptual learning going on, much like in “Dalmatian” like situations. 7. The reasons for this – why different people make different assumptions about the light source and why some people exhibit rapid perceptual learning are fundamentally unknown. There are no shortcuts here. More research on this is needed and will be done. 8. Which is the last point on this list – to my knowledge, this is the first time, a powerful stimulus display has been brought to the attention of science by social media. This also explains why this kind of thing hasn’t happened before. Surely, many people have taken overexposed pictures of fabric (the fabric might matter, too) in poor lighting conditions before. But without social media to amplify the disagreement (social media seems to be best at that), it would have ended there. So what if you disagree with your friend? We all know your friend is a bit crazy and that’s that. Easy to dismiss. But social media changes all that. So we could look forward to more of that. 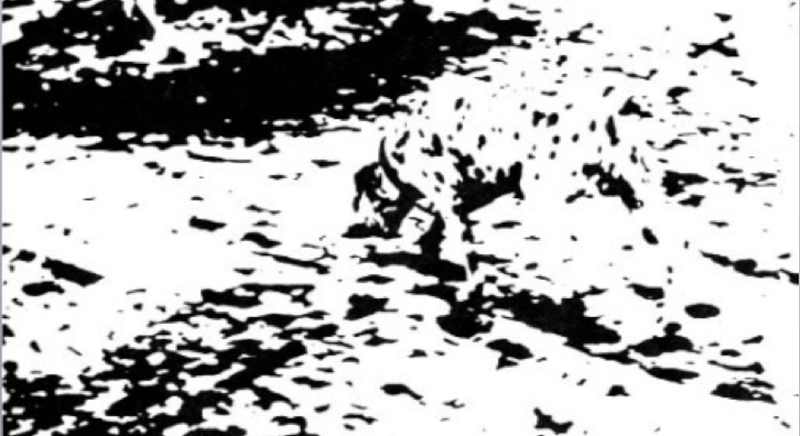 Can you see the dalmatian now? If you do: Congrats. This can not be unseen. If confronted with a display like the one above, you will always see the dalmatian. To summarize – and repeat – it’s not about the dress. It’s about visual perception and human cognition. If this is the first time you encountered that your perception – that you rely on to get safely through the day – is inherently and fundamentally unreliable, you might be skeptical, defensive or shocked. But that doesn’t change the facts. So yes, ISIS is an obvious concern. But that doesn’t mean “the dress” is trivial. It is not. As a matter of fact, I would argue that this could not be more topical. If we can’t agree about the color of a dress, how can we hope for world peace? How can we foster tolerance if we don’t allow for and don’t understand that other people can sincerely see the world differently from us? 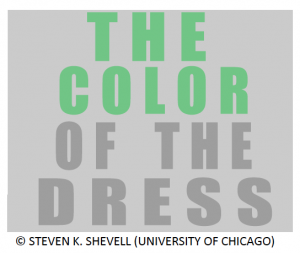 To be perfectly clear: The question is not what the color of the dress actually is. The question is why people disagree so strongly. What follows from this is that finding the original dress is not a solution to the issue. Neither will any clever analysis of light distributions in the image. There are no shortcuts here. In other to find out why the interpretation has flipped on you or why your interpretation disagrees with that of someone you care about, more research is needed. At this point, the answer is: “We don’t know, but would like to find out”. Dismissing things is easy. Research is hard. Note: We understand a lot about how vision works and how it doesn’t render a veridical percept of objective reality. But that is not the point. Vision mostly just has to be useful for survival purposes. But that does not account for the fact that different people see the same image of the dress (on the same screen) differently. It is important to acknowledge our ignorance in this regard and plan to do some research to overcome it. Human perception is more variable than most people realize, both within the same person over time and between people. This goes beyond perception, by the way. Lots of people say things like: “You said x” or “this is offensive” – a more accurate statement would be “I understood x”, or “this is offensive to me”. Big difference. So it is always advisable to keep an open mind. *Not my creation. This was one of the trending Twitter hashtags. Images shared with kind permission from Steve Shevell. This entry was posted in Neuroscience, Psychology, Science, Social commentary. Bookmark the permalink. Vision has a lograrithmic response to light. Computer screens assume that the viewer’s eye will apply its usual logarithmic correction. Given anatomocial variability, I suspect that this correction might differ slightly among individuals; that is it would be less-than-perfectly logarithmic. To allow for this aspect of human vision, computers apply gamma correction to each image. The design of the screen influences the amount of correction when the screen is viewed from different angles. (Tilt a laptop screen up or down to observe this effect.) One might think of the screen’s angle, and the gamma correction at each angle, as as a measure of the viewer’s own logarithmic correction. So: my hypothesis is that differences in the perception of the dress are due to subtle differences in the logarithmic correction achieved by each individual. Prediction: the screen angle that allows the “changeover” from gold/white to black/blue on a laptop should differ from person to person. Sigh. “Anatomocial,” indeed. I meant, of course, anatomical. I do not think this has to do with computer screens. If this image is printed on a 2D flat paper surface the same effect is had. I read your essay on Slate, and took the survey. Every time I’ve seen the picture, it was obviously white and gold. I continued reading, then scrolled up. When I got to the bottom of the same picture, the DRESS LOOKED BLUE AND BLACK! I was stunned. 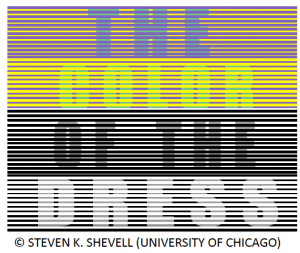 I scrolled to the top of the article, then down to the picture, and it again looked white and gold. I scrolled beyond the picture, scrolled up and as soon as I saw the hem, it looked blue and black. I don’t know what’s going on, or why looking at the bottom of the dress makes its true colors obvious, but I thought you might be interested in my experience. Allow me to “bring to light” what’s happening in that picture of a dress. 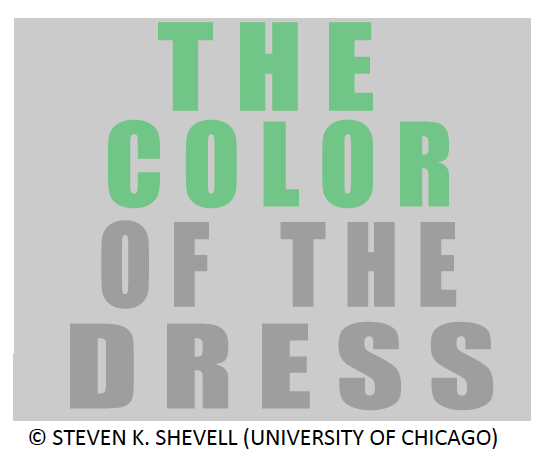 It’s not about the dress – it’s not about visual perception and human cognition neither. It’s about the shooting light conditions. First thing is that no one will ever be right or wrong pretending the dress is golden white or black and blue. It depends ! It’s a question of interpretation. Scientist, photoshop geeks, engineers, everyone seems to have an explaination, yet i’m not satisfied with ! There is in that picture a combination of several physical effects, lighting and optical tricks and more than everything, brain activity. – The first effect is metamerism (http://en.wikipedia.org/wiki/Metamerism_%28color%29). Metamerism is very common in the fabric industry, and the darker the color, the more subject to metamerism is the fabric. – A second parameter is the color temperature. A white color is never really neutral white, it’s warm or cold ! Color temperatures over 5,000K are called cool colors (bluish white), while lower color temperatures (2,700–3,000 K) are called warm colors. The actual heat temperature is the opposite of the feeling while looking at it. (http://en.wikipedia.org/wiki/Color_temperature). – A third parameter is a contrast effect called “simultaneous contrast”. (http://en.wikipedia.org/wiki/Contrast_effect). Simultaneous contrast refers to the manner in which the colors of two different objects affect each other. Or in this case, not object but background or backlight. The trick in this picture is about light. It happens while shooting the pictures ! Lets say the dress is black and blue, because the photographer is inside a building pointing the camera on a very illuminated background, he needs to put the flash on. But this flash is bluish, probably a LED light, the bluish light is going to “absorb” the blue fabric and will make appear the black yellowish due to high metamerism. Eventually, the camera sensor has to adapt to very high backlight. The background is totally burned. What happens next is in each one’s brain due to interpretation. 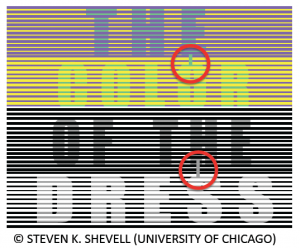 You can use photoshop to determine what the colors are depending on the file you’ve got. And you would be right because interpreting the color like a machine, a camera, a software or whatever. Or you can pretend to decode the light. Because our powerfull brain is able to identify a white support in a coloured light as “white”, when a camera is not able of such an interpretation. The machine will always combine the light and the matter (paper, fabric, plastic, metal,…) as one while your brain can separate them. Something like: “I’m looking at white paper in a blue light”. Thanks for responding in such detail. Everything you said is true. Yet, it misses the point. I assure you this would not be the case if this issue was trivial. It is not and won’t resolved without a lot of research, which *will* happen. In addition, saying that “the brain interprets it” doesn’t help. Of course it does. But why do different brains do so differently? As you said, we simply don’t know why this bistable perception happens. So I’m going to hazard a guess. The clue is that this might be related to survival where we need to quickly detect a predator or enemy. First it needs to be understood that threats need to be detected as early as possible. This means that threats are usually at the limits of our visual perception. This is the place where false interpretations of fragmentary information can have dire consequences. Since we are a social animal that operates in groups, it can be very useful if different members are able to perceive things differently. That means at least some members of the group will detect the potential threat and alert the rest of the group. Developing understanding of novel phenomena is never self-indulgent. The borderlands of knowledge are a grey area where we cannot foretell useful outcomes. We have to go there and explore the many paths. Some paths will lead to very useful outcomes but we will never know that if we never venture into the borderlands of knowledge. I am tempted to imagine that people who exhibit such a dismissive attitude couldn’t care less about the serious problems of the world. They are only concerned with scoring points in a supercilious way. A situation like this calls for the hedging of one’s bets, and that means to keep an open mind. Something to remember next time you disagree with someone. The problems of how different people see the same scene mirror the cognitive problems of how people attach different interpretations to the same situation. The measurable colours of the scene are the simple facts of the matter. But we never see the true colour because the true colour is shaped, biased and filtered before it arrives in the conscious mind. In the same way, the true facts of the situation are shaped, biased and filtered before being presented to the mind. Reflectance of the scene determines the light that is returned to our eyes. The reportage of the situation determines what facts are returned to our mind. The properties of the illuminant bias the light that we can perceive. The properties of the reporters bias the facts that we can perceive. The context of the scene shapes our expectations of the colour of the scene. Similarly the context of the situation shapes our expectation of how the situation should be interpreted. The visual processing pipeline corrects the image before presenting it to the mind. Our cognitive biases modify the facts before they arrive in the conscious mind. Given all of this it is little wonder that society is plagued by so much intense but sincere disagreement. Why then do we agree at all? Because we have to. Survival requires it. We survive because we have learned to calibrate our vision and our understanding to that of the group consensus. But visual consensus is anchored in the real world so its calibration is never too far off. However cognitive consensus is anchored in intersubjectivity. This calibration is subject to the group biases that drift over time. This creates irreconcilable difference between groups. Hence our many conflicts.